I am Victoria J. Duval, CPA and President of Duval & LaVigne Bookkeeping Services, Inc. I am a CPA Licensed in the State of Massachusetts. 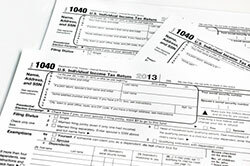 I have been preparing tax returns for over 30 years. For your convenience, we also prepare tax returns by mail for those clients who are unable to come to the office for an appointment. If you are interested in more information, please contact our office. We would be happy to answer any questions you may have. By combining Experience and genuine concern, each client receives close personal and professional attention.